Paul really goes all out on his fundraising approach for the Johnson MS Bike. With the help of his daughter, Paul created a blog to show those in his network what he is doing to prep for the event and why they should donate to help end Canada's disease. "A lot of my fundraising asks are done through email to friends, family and clients. I put a distribution list of contacts together and share my story through my blog. I find it more effective than sending out a blind carbon copy email as my emails include some entertainment. The blog includes photos of me out riding, or photos from other fundraising events. I was at a client event recently and used it as an opportunity to fundraise for the Johnson MS Bike, so I included this on my blog as well." "Every two weeks I update the blog and email it out to my distribution list, I also post the link to my blog on Facebook, and have had a great response!" Paul also makes an effort to start his fundraising when the snow starts to melt to make sure he allows his network ample time to consider contributing to the cause. "I send out my initial ask at the start of March, and then send them all the way through to after the ride when I send an epilogue to thank all who pledge me." Paul says. 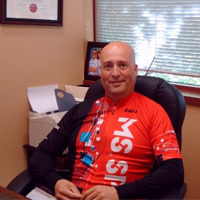 Heading into his third year at the Grand Bend to London event, he's always looking to connect with other participants to find out why they ride, which continues to inspire him, "The first year I participated, I thought I had done all the training I could. I was still nervous about actually doing the ride when a guy pulled up right next to me at the start line on an old bike, running shoes and attire you would not see many people cycling in. We started chatting and he told me his mother had MS and this is what he's doing in order to help her, but shared the same worries as I did about actually cycling." Paul says. Chatting with this gentleman really put the event into perspective for Paul, "There wasn't necessarily someone in my life I was cycling for, but now I look at this event through the eyes of those directly affected by MS, and it's the perfect motivation." Hot Pink Bootie Shorts and The Final Neon Poem!